So, carrot and chickpea soup …. excellent choice. Everyday I crack my head on how to secret veggies into our daily meals so that R would not notice. As you might have guessed, he is not the biggest fan of anything considered to be a veggie but with soups, so long as they are pureed to a pulp, he has no problems eating them. It is safe to say that 9 months out of 12 he goes veggie free, much to my dismay. The other 3 months are the colder months where I manage to get away with making heaps of vegetable soups. So I had a bag of baby carrots in the fridge and I really could not be bothered cooking a roast or doing any heavy cooking to be honest. Claire suggested I make soup, and I concurred. Thing is, I have never made a carrot soup before. *gulp* But I relied upon my trusty ‘ol motto … ‘How hard can it be?‘ And it really wasn’t; so long as you have a pot, some chicken stock and an immersion blender you are well and trully on your way to conquer any soup dish there is out there. I kid you not! Veggie soups are “da bomb” because they are so easy to make, easy to consume and give the appearance that I am a healthy eater. Combining lentils to the dish often serves as a nice thickening agent once pureed. I would also like to say that the invention of the immersion blender is also “da bomb”. There is no need to be dragging out the food processor (of which I do not own) and then having to wash all the components later. Hurrah! Getting started, I follow pretty much the same routine before embarking on a new dish : research. I like to have a general idea of what I want to achieve, in this case it’s carrot soup, and then read up on the various carrot soup variations out there, stopping first and foremost at my all time favourite website www.taste.com.au. I tend to read about 5 or 6 variations depending on how versatile the dish is. The carrot soup had like 3. I also consulted a cookbook of mine. 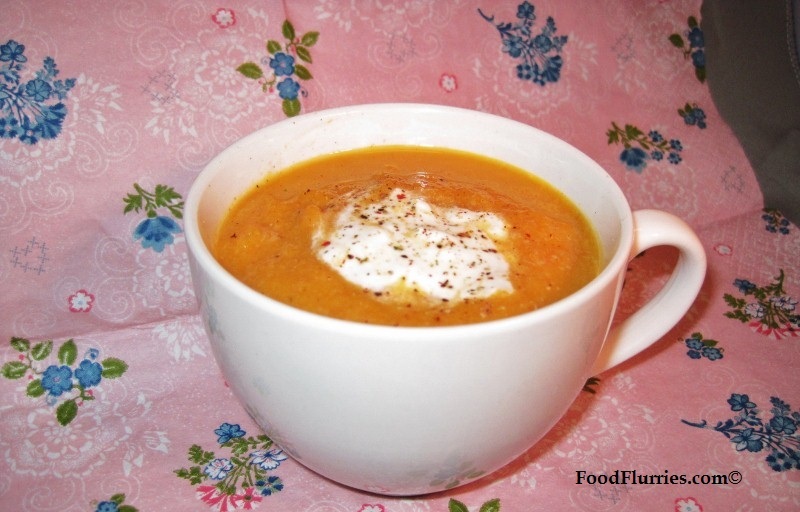 After my brief consult I learnt that the most common of carrot soups either had ginger, pumpkin or lentils in them …. so i went with the lentil option. Getting started was a breeze because in Amsterdam carrots come already trimmed and skinned for your convenience. So a bag of baby carrots, some chicken stock, leeks and a can of chickpeas later I was back home and ready to cook. Found some rashes of bacon in the fridge and I thought well bacon always makes soup taste good so they needed to go into the soup too. Prepped the leeks and fried them up with the bacon and some butter, seasoning with a little salt, pepper and a bit of ground nutmeg. Meanwhile in a seperate pot I had the chicken stock going and I threw in the carrots and ginger slices. Once the leeks had softened I added them to the pot of stock and carrots. Gave it a good stir and then added the chickpeas. A 1/2 tsp of dried herbs was used to finish it off, then I covered the pot and brought all the contents up to a gentle simmer. I kind of just left it there on the fire and forgot about it for a while. Slow cooking really brings out the full flavour of things. About 45 mins later (I cannot be 100% on that) I turned off the heat and just left the pot sitting there to cool slightly. I tasted it to see if there was enough of seasoning and then walked away. Just before serving I brought out the stick blender and pureed everything to a pulp. The mashed up beans made the soup a little too thick for my liking so I thinned it down with about three quarters of a cup of water. Then I returned it to the heat simply to heat it through and dinner was ready. A small dollop of sour cream on the top, a sprinkling of crushed black pepper and a side of crusty black olive foccacia. Mmmm …. a yummy in my tummy.